Does your frontline staff understand the important role they play in your customers’ and your company’s success? It’s an important message and one which is often overlooked in the busy service environment. But helping reps understand the value of their contributions is one of the most effective ways to improve morale, boost teamwork, and enhance professionalism. In Making a Difference Through Customer Service, your team will be reminded of the important role they play in your organization’s success and of the contribution that they make with every customer interaction. And that’s just what Making a Difference Through Customer Service does. The guide begins by discussing the most universal benefits of excellent service: Setting your company apart, building positive word-of-mouth advertising, increasing customer value, and increasing customer retention. Next it covers the expectations that all customers have and that all frontline staff must strive to meet. Customers want to see: Genuine concern, appreciation, respect, integrity, attention, fairness, and a quick resolution of any issues or concerns. Finally it presents seven ways that frontline service staff can go beyond basic expectations to make a real difference in their organizations. It is a highly motivational message, backed up with research data, examples and sample phrases to help put these important concepts into action. 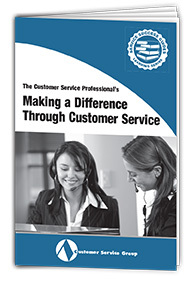 For decades customer service was considered little more than a clerical function. Then something interesting happened. Slowly but surely, organizations began to realize that there was actually a lot going on in the service department, and that with a little time and attention, the department could make a huge contribution to the organization. Modern customer service was born. And what was a long-ignored department became the eyes and ears of the company, listening to customers’ needs and concerns and spreading them throughout the organization. That department that no one really understood began working with at-risk customers to retain them, and with lost customers to win them back. The mysterious department began moving from a service function to a service-oriented selling function and became a profit center for the organization. But through all of these changes, one important thing remained clear. Every activity of the service department was directed toward one over-arching goal: serving the customer — understanding the customers’ needs, concerns and expectations, and ensuring that they are met in a timely, professional and business-building manner. 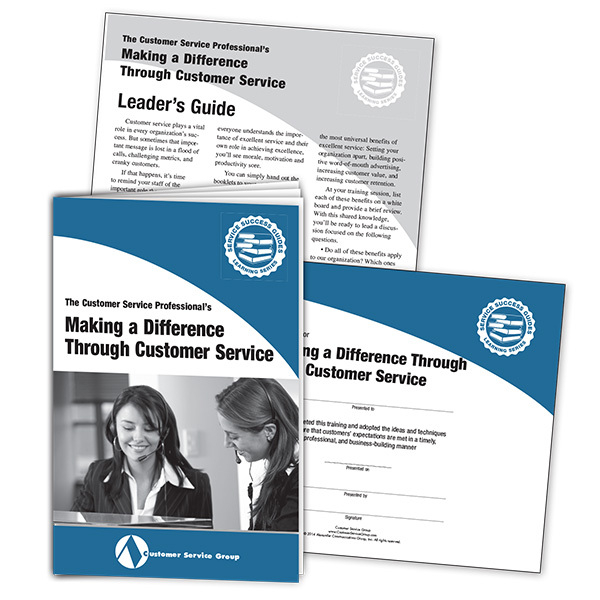 Sounds like an awfully tall order, but with the help of this booklet, you’ll discover exactly how customer service helps every organization succeed. How you as a service professional can make a difference in your service department and in your company. And how you can meet or exceed your customers’ expectations at every turn. 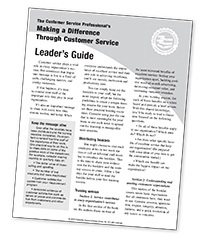 This final section of the booklet presents seven ways that frontline service staff can make a difference in their organizations: Improving products and processes, turning complaints into opportunities, being a positive force, maintaining energy and enthusiasm, sharing knowledge, working with internal customers, and upselling and cross-selling. Discussing the following three questions will help you focus attention on how these behaviors can help your own organization. Are there other specific behaviors that support our service mission? If the team agrees on additional behaviors, add them to the whiteboard and encourage reps to write them at the bottom of page 11 in the booklet. 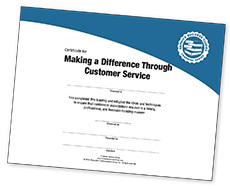 Making a Difference Through Customer Service is guaranteed. We want you and your reps to use this valuable resource and put its ideas to work in your department. Then, if you are not 100% satisfied, you may return your materials within 30 days for a full refund.